One New Market family’s Christmas tree provided a post-season surprise this year. Praying mantises — hundreds of them. The Spissos, who live in the West Winds neighborhood, went to Hardee Farms in New Midway the weekend of Dec. 3 to cut down their tree, according to Heather Spisso. The holidays passed without incident. But last weekend, days before they planned to remove the tree from their house, Heather, her husband, Matt, and their three children, Maddy, Zach and Maya, noticed something strange. Tiny creatures had populated the house and were concentrated around the tree. They were all over the walls, on the floor and on the stairway banister, Heather said. Upon closer inspection, they appeared to be baby mantises. After a bit of investigation, the family realized that the insects — 200 or more of them — had come from a walnut-size nest attached to a branch of the Christmas tree. 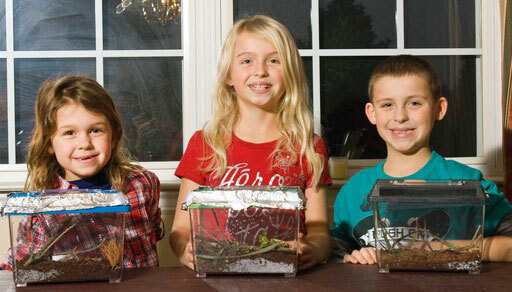 Maddy, Zach and Maya, who are 9, 7 and 5 years old respectively, started gathering up the insects. Matt Spisso bought three plastic terrariums and now the children, who attend New Market Elementary School, have a few dozen insects each. They have been studying them in their homemade habitats. “I feel like they’re my own other little pets, not like a big dog or something,” Maddy said. The “real” family pet is a large chocolate Labrador. Maya said she liked setting up her terrarium and has enjoyed watching the praying mantises drink water and explore their home. Zach’s favorite part of the experience has been counting the insects. “I love counting,” he said. “They sit here and watch them like a fish tank,” Heather said. According to Heather, the children have learned a lot since they discovered the insects. To provide a livable habitat, they had to do a lot of research. They learned that praying mantis nests can hatch anywhere from 40 to 400 babies and that the darker the babies, the healthier they are. The family plans to keep the insects in the house until the weather gets warmer. Then they will let them go outside, Heather said. Maddy, Zach and Maya are excited about keeping the unusual houseguests for a few more months. “Since they’re brown now, I want to see them grow and turn green,” Maddy said. “I want them to do a wrestling match,” Zach said, getting a giggle from each of his sisters. He is also interested to see them molt. “I want them to grow,” Maya said. She said she was excited to watch them eat other bugs, too. In addition to the terrariums, Matt bought live crickets for the mantises to feed on. Heather said she is most curious to see if the insects will reproduce. She did get annoyed with the creatures as she was taking ornaments off the tree — she had to remove two or three of them from each ball — but said she sees the overall experience as a sign of good luck. John Theofield, co-owner of Hardee Farms, said praying mantis nests are not uncommon on the property. About 10 years ago, another customer called to tell the farm about finding a nest in a tree, he said. Like Heather Spisso, Theofield does not see the insects as pests. With a smile, Heather said the bugs are welcome to have free rein in her house if it turns out they like to eat stink bugs.